In the first major update since its release last year, the Mac mini joins its iMac and MacBook Pro cousins in featuring Intel inside. The latest mini models are the third line of Macs to convert to the Intel chip, and they offer many improvements over the G4 Mac mini. The new minis are not only built with Intel processors, but also include Apple’s Front Row software and remote. Like the G4 Mac minis, the Intel minis ship without a monitor or input devices, but the cost of entry has risen by $100. Still, the mini is the most economical way to become a Mac user, add a second or third Mac to the mix, or create a Mac-based home-entertainment system. At the same time, these minis also unveil a new, and somewhat controversial, approach to the way this computer handles graphics. In general, we found that the Intel minis have a faster and more responsive feel than their predecessors when we dragged windows around in the Finder and launched native applications. But performance lagged when we opened many applications at the same time. Not surprisingly, we found a large difference between the performance of the Core Solo mini, which has a single-core processor, and the Core Duo mini, which has a dual-core processor. Like the iMac G5 ( ; January 2006 ), the Intel iMac ( ; April 2006 ), and the MacBook Pro ( ; May 2006 ), the new Mac mini includes Apple’s Front Row software and the Apple Remote, which gives you the ability to control the playback of movies, photos, and music without having to sit in front of a keyboard. The receiver for the remote control sits just to the right of the optical-drive slot. As a system that you can easily park next to a television, the mini is ideal for the Front Row software and remote combo. Moreover, concurrently with the release of the new minis, Apple updated Front Row to include a feature that’s particularly suited to the mini as a set-top box: the ability to play photos, music, and videos (assuming you have enough network bandwidth) that are stored on other computers on your network. So you don’t need to fill the mini’s hard drive with content: Apple’s zero-configuration technology, Bonjour, lets Front Row find your content easily. In our tests, media sharing worked well but had some notable glitches. As with iTunes sharing, you can’t play music or video content purchased from the iTunes Music Store unless you authorize the Mac mini for that account. If you haven’t done that, Front Row gives you cryptic error messages when you try to play such content. Also, a new Front Row feature that lets the app recognize your iPhoto slide-show settings worked fine with local photos but not with slide shows from shared libraries. And unfortunately, you still can’t shuffle songs from an artist or within a playlist in Front Row. We hooked up each mini to a Sony HDTV, using a DVI-to-HDMI adapter. We then used a digital optical output cable to send the audio to a surround-sound stereo system (neither the adapter nor the cable is included with the mini). Front Row performed admirably, letting us watch wide-screen DVDs with 5.1-channel surround sound and enjoy music and slide shows from the comfort of a couch. But getting the program to function properly took much experimentation that required a keyboard and a mouse connection: for example, we had tried changing settings in the DVD Player application, switching the Overscan setting on and off, and changing resolutions. After the initial setup, however, the keyboard and the mouse were rarely needed. Although the Intel Mac minis are almost identical to their G4 predecessors on the outside, Apple has made several big changes on the inside. Most important is the Intel processor—the mini comes with either a dual-core processor, which is also in the Intel iMac and MacBook Pro, or a single-core processor. In addition, the new minis offer a faster system bus (667MHz versus 167MHz), faster RAM (667MHz DDR2 SDRAM versus 333MHz DDR SDRAM), and more L2 cache (2MB versus 512KB)—all designed to make the mini more efficient in moving information throughout the system. The mini now has two RAM slots and can support twice as much physical RAM as before (2GB instead of 1GB)—more RAM means that more applications can be open at the same time without relying on slower virtual memory, and that boosts overall performance. We suggest that you upgrade the mini’s RAM, which ships with two 256MB modules by default. But beware: installing RAM yourself is even more complicated than before—you still need a putty knife to crack open the case, but now you also need to remove the assembly that houses the hard drive and optical drive to access the two RAM slots. Moreover, Apple recommends installing RAM in matched pairs for maximum efficiency. If you think you’ll want more RAM, we suggest having it installed when you order your mini so that you don’t have to throw away RAM you’ve paid for. You can choose between two 512MB modules for 1GB, or two 1GB modules for the 2GB maximum. Although the minis’ prices are higher than before, each one comes with AirPort Extreme and Bluetooth 2.0 wireless capabilities, as well as Gigabit Ethernet. And the $799 model includes a SuperDrive with dual-layer DVD burning support. As with the other Intel Macs, Apple has removed the built-in modem but offers a USB external modem for $49. The minis now have Serial ATA hard drives, which offer 1.5 times the bus bandwidth of the previous ATA drives. Apple retained the single FireWire 400 port but doubled the number of USB 2.0 ports on the back from two to four—a welcome addition. Earlier models were practically unusable without adding a USB hub to gain access to extra ports. Apple also added sound input in analog and digital flavors, as well as digital audio output—a huge boon for people who want to connect the mini to a home-entertainment system. The new Mac minis take a different approach to graphics than their predecessors. Last year, Apple trumpeted the ATI Radeon 9200 graphics chip with 32MB of dedicated DDR memory instead of a graphics structure that borrowed its memory from the system. But in the new minis, that’s exactly what Apple uses. The mini’s integrated graphics feature is a mixed bag, though, since it adds to and subtracts from the previous graphics features. The Intel mini’s GMA950 graphics chip has 64MB of RAM dedicated to it from the main memory. That’s twice as much RAM as the Radeon 9200 had, and it’s faster system RAM than ordinary video RAM. But after you figure in an additional 16MB reserved for general system setup, a standard 512MB Mac mini is left with only 432MB of operating RAM once the 64MB is diverted to the graphics system. On the plus side, these minis are the first minis that support Tiger’s Core Image technology, which gives you more special effects capabilities. For example, you can now see the ripple effect as you add a widget to Dashboard. We also found that resizing QuickTime and DVD Player windows was much smoother than on the G4 Mac minis. The GMA950 chip also supports H.264 HD video playback. In our test of an HD movie trailer for IMAX’s Deep Sea 3D (H.264 encoding at 1,440 by 1,080 pixels), the Core Duo model played the video back smoothly. The Core Solo model, however, dropped frames, leading to distracting, stuttering video—even after we upgraded it to 1GB of RAM. When it comes to graphics-intensive 3-D games, our tests of the Intel-native version of Unreal Tournament showed disappointing frame rates of 12.2 per second for the Core Duo and 10.4 per second for the Core Solo—compared with 14.5 and 13.9 for the 1.42GHz G4 mini and the 1.25GHz G4 mini, respectively. But during casual game play, when we used the lower settings that are more suited for the mini, we got decent performance from the game. When we tested the Universal version of Nanosaur II, which takes advantage of the fast Intel processors, we found frame rates increased by roughly 33 percent over the previous Mac minis. And the suite of bundled board games—with 3-D game pieces and reflections—play perfectly on both systems. However, if you’re looking for a super high-quality gaming experience, you’ll get much better performance from the latest iMacs. The Macworld Lab ran a full gamut of tests on the Intel minis to see how they stack up against both the previous Mac minis and the other Intel-based Mac models. Not surprisingly, the Core Duo mini—with two cores and faster clock speeds—outshined the Core Solo mini in every test. Our standard rendering test, using the Universal Cinema 4D XL application, was nearly twice as fast on the Core Duo model as on the Core Solo mini, and even the Solo shaved 91 seconds off the time it took the 1.42GHz G4 mini to perform the test—a speed boost of almost 34 percent. The Core Duo performed equally well in our iMovie filtering and iTunes encoding tests, whereas the Core Solo model clocked speeds in-between or worse than the previous minis in those tests. For people who need to use applications that have not yet been updated to run natively on Intel processors, Apple’s Rosetta translation technology works very well on the new minis, but there is a significant speed hit. In our Adobe Photoshop CS2 test suite, for example, both models performed much slower than even the 1.25GHz G4 Mac mini, taking 51 percent longer (Core Duo) and 117 percent longer (Core Solo) to complete their tasks. On the other hand, it was a pleasure to run most iLife ’06 applications: we found that iPhoto’s Adjust Image palette worked very well (better than with previous models), but the same adjustments in iWeb were painfully slow when altering more than one parameter. In January 2005, Apple introduced the Mac mini as a low-cost Mac—and it still is, even though the price of admission has increased by $100. The Mac mini Core Duo’s built-in improvements and performance boost are worth the higher cost. And although the Core Solo model clearly underperforms compared with the Core Duo in almost every respect, it’s still a good entry-level Mac for the money. If you’re concerned about the Intel minis’ shared-RAM strategy and lack of a monitor, keyboard, and mouse, and if you want better performance over time without spending much more money, you may want to consider an Intel iMac. 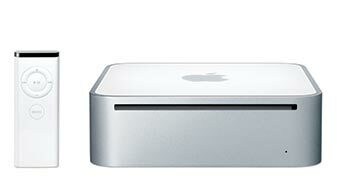 One of two Intel-based Mac minis, this model features a 1.5GHz single-core processor. The form factor of this mini remains unchanged from its PowerPC-based predecessor, although it adds two additional USB 2.0 ports for a total of four while dropping S-video and composite ports. Internally, the new mini has a faster frontside bus and built-in wireless networking via AirPort Extreme and Bluetooth. The mini uses the Intel GMA950 as its graphics processor; since the chip doesn' have its own dedicated video memory, it shares memory with the main system RAM. The mini also gains the remote-and-software combo that makes up Front Row, allowing you to control audio, video, and photos from across the room.